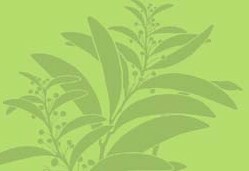 Description: Annual herb, prostrate, stemless or branches to 10 cm long, woolly grey-brown to grey-green. Leaves ± spathulate, oblanceolate or obovate, 3–13 mm long, 1.5–5 mm wide, woolly, sessile or petiole < 2 mm long. 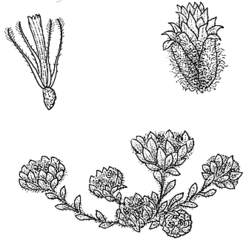 Inflorescence of 1 or 2–12 heads in a compound head; compound heads ± cylindrical or broad-depressed, yellow, woolly; general involucral bracts c. 15–20, subequal to head; partial heads with c. 30–60 florets, bracts usually 19–28 with upper portion reflexed and pale yellow. Achenes ± angular, 0.75–0.85 mm long, brown, papillose; pappus bristles barbellate, sometimes plumose towards apex, ± as long as florets, falling with corolla. Distribution and occurrence: Usually grows on sandy soils where perennial pasture is sparse, widespread in inland districts, west from Mudgee.